Explore some of Oakland County’s lakeside communities and the lifestyle afforded by living on the water. To some, it means tranquility and serenity, being rejuvenated by a view that’s never the same, yet always mesmerizing. It is a sanctuary. Others are inspired by the recreational opportunities and vibrancy of the water. Those that live the comfortable lake lifestyle value quality: quality in their home, quality time with their family and friends and quality of life. Oakland County is renowned for its communities that are surrounded by sparking lakes, rich woodlands and natural beauty. Cass Lake is Oakland County’s largest lake at 1,280 acres. It has an average depth of 26 feet, with the deepest point reaching 123 feet. It is a public access lake in the heart of Oakland County. The fantastic location offers easy access for boaters and makes Cass Lake very popular. Union Lake is a 465-acre public lake on the Northwestern edge of West Bloomfield. The deepest spot is about 110 feet. There is a restaurant on the lake called, “Matter of Taste”. There is also a sandbar in the center of the lake that residents gather at to enjoy sunsets and the natural beauty of the water. Pine Lake is a 395-acre private lake. The maximum depth is about 90 feet. There is a marina on the lake, and a ski/wake board school. This highly desirable upper end lake has many lakefront estates that offer between 40' - 100' of lake frontage. The prestigious Pine Lake Country Club is also located on this lake. The private club has pools and decks, a beautiful clubhouse, outdoor tennis courts, beach, indoor tennis house, golf course and more. Upper Straits Lake is a 232-acre private lake, with a max depth of 96 feet. There are about 210 homes on the lake and almost 600 lake access homes. The lake lots on Upper Straight Lake are valuable and high priced. The majority of Upper Straits Lake lies in West Bloomfield, but a portion of it falls in Orchard Lake Village. Walnut Lake is a private lake measuring 232 acres, with maximum depth of 101 feet. There are larger lots on this lake, and the shoreline is lined with exclusive, high-end homes. Several lake associations are available for the lake access homes. Middle Straits Lake measures at 171 acres and with a maximum depth of 51 feet. This lake is semi-private, meaning there is a ramp and small parking lot for visitors, but the beach areas are private to the waterfront homeowners only. Middle Straits Lake has a safe and enjoyable atmosphere. There are many recreational opportunities such as parks, picnic areas and private lake parks. Orchard Lake Village is another prominent lake community in Oakland county that offers lakefront living at its finest. The city surrounds its namesake, Orchard Lake, the county’s second largest all sports lake measuring at 783 acres. Most of this lake lies in Orchard Lake Village, but a portion of it lies within the city of West Bloomfield. Orchard Lake Village also includes a segment of Upper Straits Lake and borders, along its northern limits, the waters of Cass Lake. Smaller than the neighboring lake cities, with a population of only 2,215, Orchard Lake Village sits as an exclusive community. There is a very high demand to live in this affluent suburb. It promises privacy and comfortable living, making it attractive to its upscale residents. Adding to the appeal is the presence of the elite Orchard Lake Country Club. OLCC is one of the finest golf and country clubs in Michigan and is known for having exceptional standards. Oakland County’s smaller lakes lie within Bloomfield Hills and Bloomfield Twp. The area is also home to a bountiful collection of ponds, canals and other water features full of natural beauty. Bloomfield Township is suburban with well-maintained subdivisions. The Township is distinguished by rolling hills, winding roads, scenic lakes and streams. All lakes within Bloomfield Township are private, utilized by waterfront residents for a number of recreational pursuits, including boating, swimming, and fishing. Gilbert Lake is a charming, quiet lake measuring at 63 acres, an average depth of 5.7 feet and maximum of 18 feet. The shoreline is 1.8 miles long, with approximately 45 homes directly bordering the lake. These spacious lake lots are surrounded by mature trees and sit on land elevated above the water for a phenomenal view. Grand estates also perch upon the two islands within Gilbert Lake, providing the epitome of lakefront luxury. Island Lake is an all sports lake in the prestigious Kirk in the Hills community. The lake is 111 acres in size, an average depth of 13.3 feet and maximum of 55 feet. The shoreline is about 2.6 miles long, with many multimillion-dollar homes and luxury lakefront properties. The space and lot sizes of the homes make it extremely desirable. Lower Long Lake has an approximate surface area of 190 acres and a shoreline 5.1 miles long. The properties along the water have generous frontage and are relatively large in size when compared to many other Oakland County Lakes. Wing Lake is a privately owned 108-acre lake. The average depth is 14 feet, with the deepest point reaching 90 feet. The two miles of shoreline surrounding Wing Lake are filled with many beautiful high-end homes with access to the water. There are also neighborhoods that offer park/beach access on the lake. Residents enjoy a laid-back lifestyle while swimming, kayaking and paddling around the lake, basking in the serenity. In addition to these upper end prestigious lakes, the township has numerous other small ponds that offer additional opportunities for waterside living. 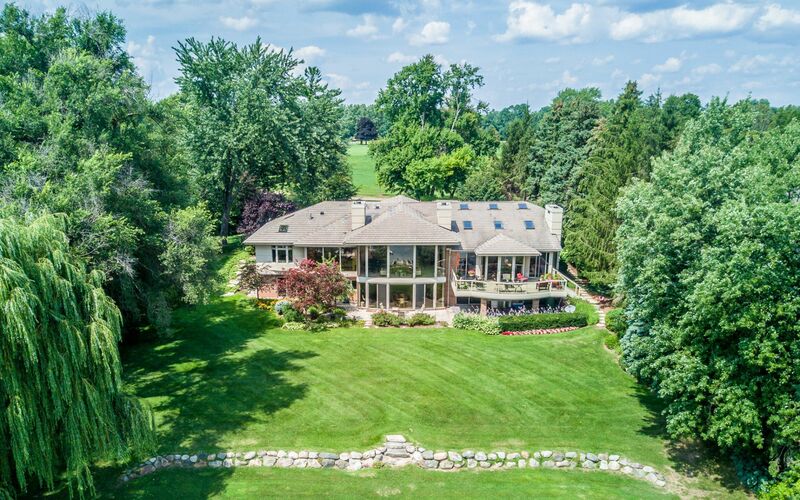 The majority of Bloomfield Hills is residential and known for large stately homes in beautiful settings. There are a small number of lakes in the area, making the surrounding lake communities high-end and exclusive. There are also many diverse water features that offer an expansive opportunity to indulge in various types of waterfront living. Turtle Lake is a private lake only accessible to the surrounding Turtle Lake community. This low-density, high quality community provides an exceptional country lifestyle just minutes from the city. It is the last private lake property in Bloomfield Hills. Developed by David V. Johnson, this affluent community was originally approved for 277 home sites, but Johnson decided to stop development at 101 homes for residents to enjoy privacy, unparalleled beauty, phenomenal architecture and a sense of community. The prestigious Turtle Lake community is spread out over 256 acres of rolling topography and terrain in eight separate neighborhoods. Three neighborhoods; The Shores, The Ridge, and The Estates, feature lots with frontage on Turtle Lake while the Cove features lots with frontage on Upper Long Lake. The Pond features estate lots on Turtle Pond and The Bluff offers elevated views of Turtle Lake. The Woods and Preserve offer Woodland living. Vhay Lake is a smaller lake, measuring about 14 acres in size. Many private gated Bloomfield Hills’ communities surround the shoreline. These lake communities offer an amazing park-like setting with tree-lined streets, “in-community” walking trails, sidewalks and lake frontage. The private lake is adjacent to the distinguished Bloomfield Open Hunt Club. Club members are offered access to various amenities such as, swimming pools, indoor and outdoor tennis, gyms, saunas, state of the art equestrian facilities and complete stable. Bloomfield Open Hunt Club has been hosting horse shows for over 50 years and serves as the training site for the Michigan Olympic Equestrian Team. Absolutely nothing compares to waking up to the tranquility of living on the water or coming home to a view unspoiled by development. Whether you’re right on the lake or simply a canal, a truly peaceful sense comes with living on a waterfront property. Oakland County has a fantastic selection of waterside and lakefront properties for you to call home.